This is the first week of riding my new bike to work and rather than riding to the train station and leaving it there, I'd rather drive most of the way and cycle the rest. Why don't I take my bike on the train with me I hear you say? Well, Southern Trains have a policy of no bikes, except folding bikes, on trains bound to or from London between the hours of 7-10am and 4-7pm. That rules out me taking it on the train. I could try and take it with me as some staff may have no objections. But I don't want to be in the position where a jobs-worth won't let me on the train one day and I have to miss my train while I go and lock it up. Until my pride and joy is old enough that I'd be prepared to leave it at the station, I'm putting the bike in the back of the car. 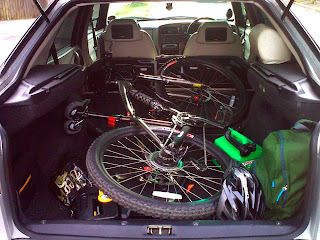 I did think about getting a bike rack but my car has such a cavernous boot with the seats down that I can easily get the bike in and out of the car within 20 seconds. My first goal is to do at least 6 miles a day. 3 miles there and 3 miles back. That way the bike pays for itself in reduced petrol costs. I do intend to get fit enough to ride the 9.1 miles each way but probably not ride that every day. My final goal is to take part in the 2011 London to Brighton bike ride which is 54 miles. I'v got 15 months until then so I hope I'll be fit enough.